Finishing can be one of the biggest headaches for many woodworkers and refinishers. One of the reasons for this revolves around the huge ever growing amount of choices. Deciding on the right finish is a daunting task in some applications. We'll try to make your selection easier. Finishing products can be grouped into manageable categories, based on general working qualities and the degrees of protection they offer: waxes, oils, varnishes, shellacs, lacquers and water-based finishes. Different finishes offer varying degrees of protection, durability, ease of application, reparability and aesthetics. Finishing can be one of the biggest headaches for many woodworkers part time restorers. The reason for this mostly centers around the vast amount of choices. Choosing the right finish is a daunting task in certain applications. Once the choice is made, and a finish had been selected for the job, proper preparation and precise application will go a long way in giving you a beautiful and durable finish that will last for many years. Finishing products can be grouped into manageable categories, based on general working qualities and the degrees of protection they offer: waxes, oils, varnishes, shellacs, lacquers and water-based finishes. Different finishes offer varying degrees of protection, durability, ease of application, reparability and aesthetics. Unfortunately, no single finish excels in all of these categories -- a finish that excels in one may fail in another -- so in choosing a finish you must accept trade-offs. As a professional refinisher, I routinely ask my customers a series of questions to determine the best finish for their furniture. I've modified my standard questions for this article and added a few as a Checklist for woodworkers trying to decide which finish to use on their own projects. Answers to these questions will point you toward the right finish to use on a given project, based on how well you need to protect the surface, how well the finish will hold up, how easy it is to apply and how you want it to look. To get a better understanding of the choices, let's first take a look at the different categories of wood finishes. All wood finishes can be classified as one of two distinctly different types, based on how they dry, or cure. Evaporative finishes--such as lacquer, shellac and many water-based finishes--dry to a hard film as the solvents evaporate. (Water is not a solvent -- it's a carrier for the finish emulsion.) These types of finishes will always redissolve in the solvent used to thin them, long after they've dried, so they tend to be less durable than reactive finishes. Most reactive finishes -- such as linseed or tung oil, catalyzed lacquers and varnishes -- also contain solvents that evaporate, but they cure by reacting with either air outside the can or a chemical placed in the can before application. These finishes undergo a chemical change as they cure, and after that they will not redissolve in the solvent originally used to thin them. Except for the pure oils, reactive finishes tend to hold up better to heat and chemicals. Waxes -- I don't consider wax an appropriate finish in and of itself. I use paste wax (carnauba mostly, sometimes beeswax) to polish furniture but only over other finishes, such as lacquer or shellac. The true oils -- Linseed oil and tung oil, the drying oils most often used in finishing, are readily available and relatively inexpensive. These finishes are called true oils to distinguish them from other products hyped as oil finishes and to separate them from naturally nondrying or semidrying oils used in finishes, such as soybean oil. These true oils change from a liquid to a solid through polymerization, a process that strengthens the cured finish. Linseed oil is available in several forms. Unrefined, it's called raw linseed oil, which is rarely used on wood because it dries so slowly. Finishers long ago discovered that by boiling the oil, the resulting product was thicker and dried more quickly. Even though linseed oil that has actually been boiled is still available -- it's called heat-treated or polymerized oil -- most of the boiled linseed oil sold these days is raw oil that has been mixed with chemical additives to speed up the drying time. For wood finishing, you should use only boiled linseed oil. Tung oil is derived from the nuts of trees that are native to Asia but have been cultivated in other parts of the world. Tung oil is available in a pure, unrefined form and in a heat-treated or polymerized form. The heat-treating process makes the oil a bit more durable and speeds up the drying time. It also minimizes a tendency of tung oil to "frost" (dry to a whitish, matte appearance). Tung oil is paler in color and has better moisture resistance than linseed oil. Both linseed and tung oils are penetrating finishes, which means they penetrate the fibers of the wood and harden. These are the easiest finishes to apply: Wipe them on, allow them to penetrate the surface of the wood and wipe off the excess with a rag. These oils are usually not built up with enough coats to form a surface film, like that of varnish or lacquer, because the film is too soft. 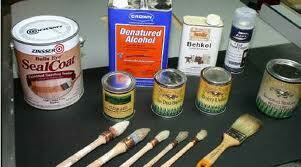 Varnishes -- Varnish is made of tough and durable synthetic resins that have been modified with drying oils. Labels on cans of varnish will list resins such as alkyd, phenolic and urethane, and the oils used are tung and linseed, as well as other semidrying oils such as soybean and safflower. Varnish cures by the same process as true oils -- polymerization -- but the resins make this finish more durable than oil. In fact, oil-based varnish is the most durable finish that can be easily applied by the average woodworker. Varnish surpasses most other finishes in its resistance to water, heat, solvents and other chemicals. Varnishes that contain a high percentage of oil are called long-oil varnishes. These include marine, spar or exterior varnishes and some interior varnishes for sale on the retail market. Long-oil varnishes are more elastic and softer than medium- and short-oil varnishes that contain a lower percentage of oil. Medium-oil varnishes comprise most interior varnishes on the market. Short-oil varnishes (also known as heat-set varnishes and baking enamels) require extremely high temperatures to dry, so they're used only in industrial applications. The type of resin used in the varnish determines the characteristics of the finish. Alkyd varnish is the standard all-purpose interior variety with decent protective qualities. Phenolic varnish, usually made with tung oil, is predominantly for exterior use. Urethane varnish, also called polyurethane, offers a better resistance to heat, solvents and abrasions than any other varnish. Varnish is typically applied with a brush, although a highly thinned and gelled version, called wiping varnish, can be applied with a rag. Oil and varnish blends -- These mixtures, mostly oil with some varnish added, offer some of the best attributes of both ingredients: the easy application of true oils and the protective qualities of varnish. (Watco-brand Danish oil, teak oil and a number of other finishes fall into this category.) It's difficult to ascribe accurate protective qualities to these products because manufacturers don't usually disclose the ratio of oil to varnish. Oil and varnish blends will dry a bit harder than true oils, and the finishes will build quicker with fewer applications. Shellacs -- While most people think of shellac as a liquid finish found at a paint store, in its pure form it's a natural resin secreted from a bug that feeds on trees, mostly in India and Thailand. The secretions, in the form of cocoons, are gathered and eventually refined into dry flakes, which are then dissolved in denatured (ethyl) alcohol to make the shellac solution that winds up in cans at the store. Shellac is available in several varieties. You can buy it premixed, or you can buy it in flake form and mix it yourself with denatured alcohol. The premixed variety is available in orange (amber) and clear, which is shellac that's been bleached. With the flakes, shellac is available in a wider variety of colors and wax contents than with the premixed version (which contains wax). The wax in shellac decreases the finish's resistance to water and prevents some finishes from bonding to it. Lacquers -- Most professionals still regard lacquer as the best all-around finish for wood because it dries fast, imparts an incredible depth and richness to the wood, exhibits moderate to excellent durability (depending on the type used) and rubs out well. There are several different types of lacquer, and they exhibit different performance characteristics. Nitrocellulose lacquer is the most common. If the label on the can says lacquer, it's most likely nitrocellulose, which is made from an alkyd and nitrocellulose resin dissolved and then mixed with solvents that evaporate quickly. This type of lacquer has moderate water resistance, but it's sensitive to heat and certain solvents. The biggest drawback is the finish's tendency to yellow as it ages, which shows clearly on light-colored woods. Acrylic-modified lacquer is made from a mixture of a non-yellowing cellulose resin (called cellulose acetate butyrate, or CAB) and acrylic. This lacquer possesses the same general properties of nitrocellulose lacquer, except it is absolutely water-white, meaning it will not show as an amber color when applied over light-colored woods. Also, the finish won't turn yellow over time. Catalyzed lacquer bridges the gap between the application traits of nitrocellulose lacquer and the durability of varnish. Catalyzed lacquer is a complex finish composed of urea formaldehyde or urea melamine and an alkyd that has some nitrocellulose resin added to make it handle like normal lacquer. The addition of an acid catalyst initiates a chemical reaction that forms a very tough, durable finish. Catalyzed lacquer comes in two versions: precatalyzed and post-catalyzed. Precatalyzed lacquer has the components premixed, either by the manufacturer or at the store when you buy it; post-catalyzed lacquer is a two-part system that you must mix in your shop, following precise ratios. Once the catalyst has been added, these lacquers have a fairly short pot life (the time in which they can be used). contains some of the same ingredients as varnish and lacquer -- notably urethane, alkyd and acrylic -- but many flammable and polluting ingredients have been replaced with water. The chemistry in this product is complex. Because the resins don't have a natural affinity for water, they must be chemically modified or forced to combine with water. Water-based finish is usually made with either an acrylic resin (sold as water-based lacquer) or an acrylic urethane mixture (sold as water-based polyurethane). As with varnish, the addition of the urethane makes the resin tougher and more scratch resistant, but water-based urethane does not have the same solvent and heat resistance as its oil-based counterpart. What finishes are more durable? The durability of a finish is measured by its resistance to water, chemicals, solvents (such as those in alkaline cleaners and acidic foods), heat and scratches. Wax, shellac, lacquer and some water-based finishes will be damaged if exposed to water long enough. Most of these products also scratch easily; however, they rub out well. (That's the flip side of scratch resistance.) Wax is surprisingly resistant to acids and alkalis. Aside from that, it is the least durable finish. Shellac is neither resistant to alkalis such as ammonia nor to alcohol. Of all the evaporative finishes, lacquer (nitrocellulose and acrylic, water- and solvent-based) fare the best in terms of overall durability. Oil-based polyurethane is the most durable finish you can apply by hand, and catalyzed lacquer and varnish are the most durable sprayed finishes. Your level of experience, the environment in which you work and whether you're set up to spray all play a part in deciding which finish to use. The temperature and dampness of your shop, as well as the amount of sanding dust in the air, will affect your choice. Dust falling onto a finish does not pose as great a problem with lacquer or shellac as it would with a slow-drying finish such as varnish. Shellac and lacquer are also the least temperamental when it comes to cold temperatures, and they can be modified with retarder additives for hot and humid conditions. Oils and oil-based products dry slowly in cold temperatures and humid conditions, and dust is always a problem when it has time to become embedded in the dried film. Spray equipment requires a larger budget and, in most cases, expensive equipment to exhaust the overspray. There's also a learning curve with spraying, so it will likely take some practice before you get decent results. Do you want a natural "in-the-wood" finish? Or does your work demand an elegant, deep, glass-smooth finish? Is the color of the finish a problem, or will yellowing of the finish be a problem down the road? Traditionally, woodworkers have turned to oil, wax or oil and varnish blends (such as Watco) for a natural-looking finish. None of these easy-to-apply finishes dries to form a hard surface film. However, you can get a natural-looking effect with any finish -- including varnish, shellac and lacquer -- as long as you don't build it up more than a few coats and you rub out the dried film with steel wool. But if your goal is a filled-pore, deep, lustrous finish, you must use a hard, film-forming finish (varnish, shellac or lacquer). This type of finish is also mandatory when you have to perform complex coloring options like toning and glazing. The color and the penetration of the finish itself may be an issue. Orange shellac and phenolic-resin varnish both have colors that may be too dark for woods that you may want to keep as light as possible. In addition, many finishes deepen or darken the wood surface. In most cases this is desirable, because it adds depth and increases luster. However, you may want to downplay any deepening effect. Some delicately figured woods (such as pearwood) will appear muddy when an oil finish is applied. Oil and oil-based varnish, solvent-based lacquer and shellac all deepen the color of the wood and increase surface luster the most. These finishes wet the cells of the wood, penetrating into the surface. Other film finishes -- notably water-based finishes and some catalyzed lacquers -- tend to lie on the surface. By not penetrating it as much, they make the wood appear lighter in color. The plastic look that's sometimes ascribed to polyurethane and catalyzed lacquers has more to do with the incorrect application of these finishes than it does with the finishes themselves. On open-pored woods (plainsawn ash or oak, for example) the application of thick varnish and lacquer can result in a soupy look on the surface. This is a consequence of the finish film bridging across the open pores rather than flowing into them. By thinning these finishes you can achieve more attractive results. My favorite method to apply oil-based polyurethane is to thin the finish 50% with mineral spirits and wipe it on. A finish film that turns yellow with age will be noticeable with unstained, light-colored woods, such as maple or birch. An acrylic finish, water- or solvent-based, does not have this problem. Paste wax and some catalyzed finishes also will not yellow. A solvent-based finish, such as varnish and lacquer, contains a good deal of organic solvents, which can affect the environment as well as your health. It's also highly flammable. If these particulars pose a problem for you, use a water-based finish to eliminate the fire hazard and to mitigate the environmental and health impact. Pure oil is a surprisingly good alternative to a solvent-based lacquer or varnish: Pure oil contains no solvents and comes from renewable resources. However, oil-soaked rags must be disposed of carefully. Shellac is also a good alternative. The solvent for shellac, denatured alcohol, is distilled from corn, and most people don't find the fleeting odor objectionable. All finishes are nontoxic when fully cured, despite what you may have read or heard. Once the solvents have evaporated, any cured film is safe for contact with food. This does not mean that the finish itself is safe to gobble up. It means simply that additives such as heavy-metal driers and plasticizers are encapsulated well enough that they do not migrate into your food. Wax and shellac (apples and candy are coated with these) are the only edible finishes that I'm aware of, besides mineral oil, which is sold as a laxative. Spraying wastes a great deal of the finish material, and the organic solvents are dispersed into the air. Brushing or wiping on a finish is a practical, though less speedy, alternative.